Ok, here it is. The event I’ve been wanting to kick off is to become a reality. I moved into Hungerford some 9-years ago and have recently developed an almost uncontrollable urge to [do something for the community]. For those that know me, you’ll have already guessed that cycling was going to be central to such an urge. So, following on from the theme of another well know event annual event, I looked for a possible cycle challenge for anybody who wished to [prove that they can] complete the event. Two very worthy cause which will hopefully encourage lots of interest and support. Depart Hungerford and cycle (60 miles) to Portsmouth ferry terminal for overnight crossing to Saint-Malo. Depart Saint-Malo and cycle (55 miles) to Rennes. 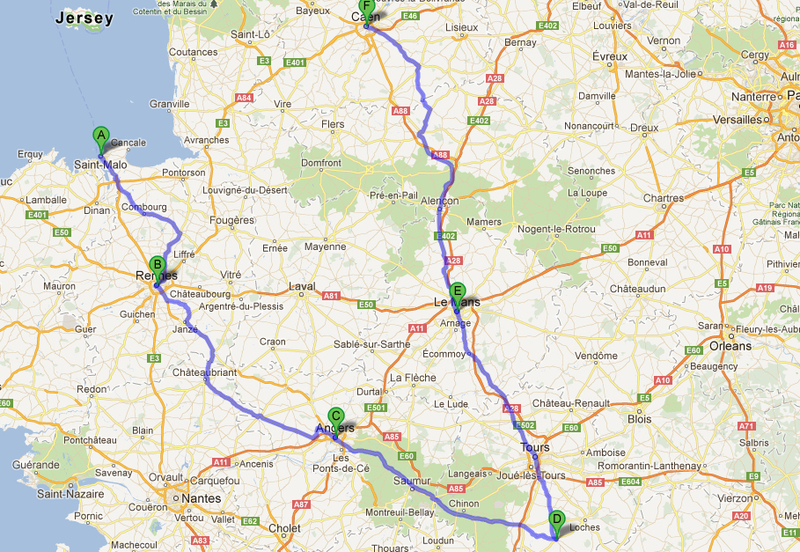 Depart Rennes and cycle (86 miles) to Angers. Depart angers and cycle (80 miles) to Ligueil. Depart Ligueil and cycle (80 miles) to Le Mans. Depart Le Mans and cycle (110 miles) to Caen – regrouping at Pegasus Bridge before heading for overnight ferry to Portsmouth. Depart Portsmouth and cycle (60) miles back to Hungerford for end of ride celebration. If possible, we will try to coincide the home coming with the Hungerford Carnival. If you feel that you might like to take part in this event, then please do let me know of your interest (this does not commit you) and I shall add you to the mailing list. It is by riding a bicycle that you learn the contours of a country best, since you have to sweat up the hills and coast down them. Thus you remember them as they actually are, while in a motor car, only a high will impress you, and you’ll have no such accurate remembrance of country you have driven through as you gain by riding a bicycle.